You leave Ingham on the back road to Ampton, and soon the lane curves widely through the meadows towards rising ground and woodlands. Beyond them, unseen, is Ampton Water. St Andrew is visible off in the fields long before you get to it. 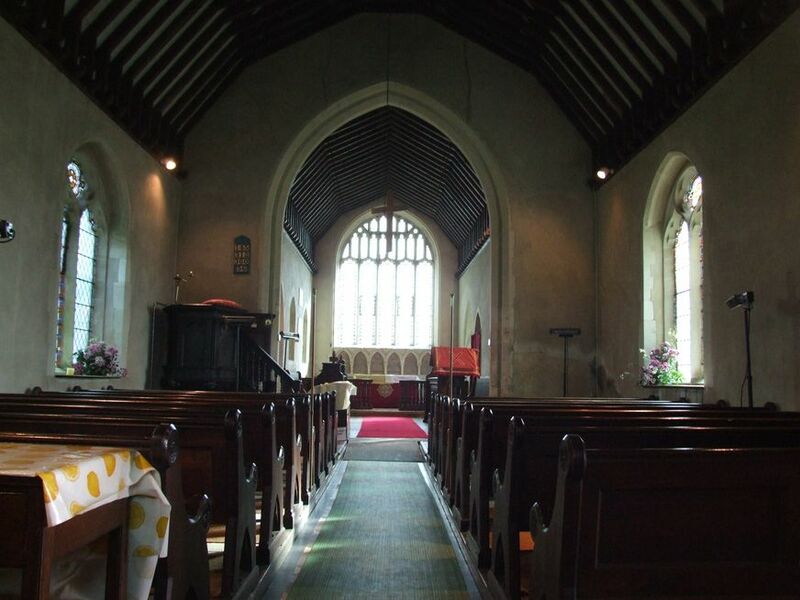 The church stands in splendid isolation, a good half mile from the nearest other building, away from the road, and you reach it down a narrow track beside hilly fields. When I first came here, on one of the hottest days of 1999, it was like being in some backwater of the Loire Valley. Coming back on a crisp winter day in early 2008, an afternoon mist beginning to condense out in the fields, the mood was quite different, but no less beautiful. The graveyard is sheltered by trees, and rises towards the north. There is a silence here which is difficult to find in the southern half of England these days. 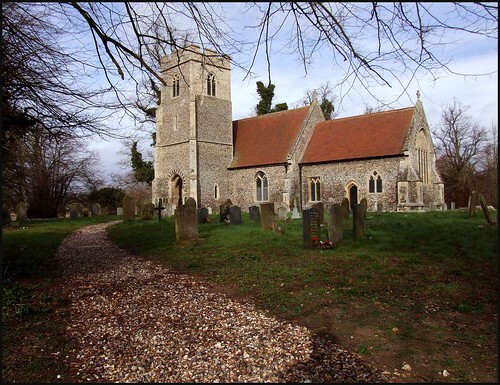 It is said that parish churches are often found a long way from their village centres because inhabitants died, or moved away, at the time of the Black Death. 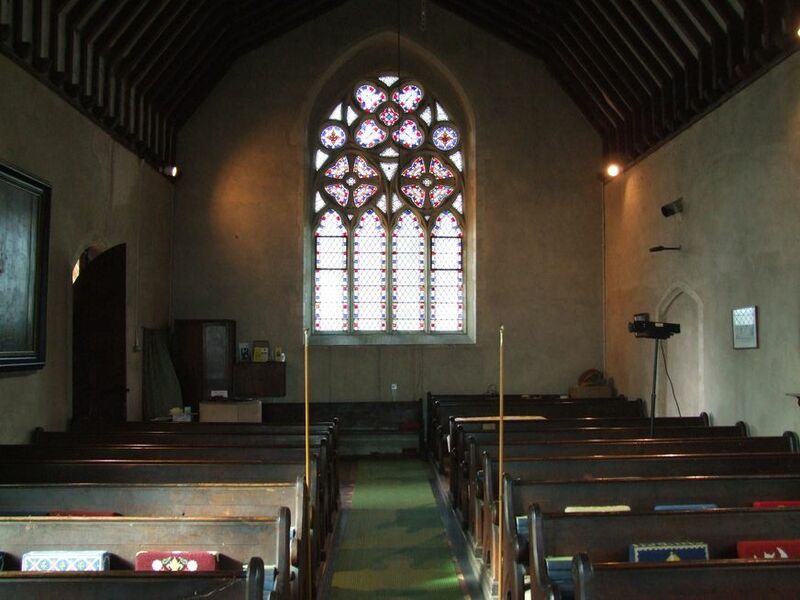 Of course, there are a hundred and one reasons why a village church should be remote, most of them economic, and these can have just as dramatic an effect on people's lives as pestilence does. Certainly, old photographs of the church show buildings to the south of it, but no trace of them remains. In fact, there is no village centre anymore. St Andrew has one of Suffolk's south towers, and as in many cases the porch serves as the bell-ringing chamber, so you walk in through hanging ropes. On the western door jamb there is a fine collection of 18th century graffiti. You step into the deep silence of a building which is, to all intents and purposes, a Victorian church within a medieval shell. The reredos is identical to the one at Culford, a couple of miles off. The pulpit is huge, with an ornate staircase looking like something out of a French cathedral. Perhaps it is the resonances of the early 20th century which are strongest, though. The war memorial has a terrifying number of names on it for such a tiny parish. At first, I thought it was a roll of honour, but no - it lists the dates of death. A small plaque commemorates a fondly-remembered Rector from later in that century. The royal arms of William IV survive from a hundred years or so before. Unlike its neighbour at Ingham, Timworth church has a keyholder notice, but this is exactly the kind of church which should be open all the time. Almost everything not nailed down has been taken by vandals and thieves anyway. But what an act of witness to strangers and pilgrims this building would be if it was accessible for prayer and meditation! The parish population is tiny, and only two local residents still attend services here, other members of the congregation coming in from elsewhere. But the Church of England has begun to understand that the primary purpose of its existence is not to serve the Sunday club, but to be a presence for all people. Now, increasing numbers of remote, rural churches with tiny congregations are altering their priorities to be such a presence. How beautiful it would be if that could happen here.